Last month, a yellowface production of Gilbert & Sullivan’s operetta “The Mikado” — put on by local Seattle Gilbert & Sullivan Society — sparked national controversy and a number of outraged articles. Multiple Asian American writers and advocates spoke out against the use of yellowface in “The Mikado” (including Sean Miura, who published a compelling guest post on this site) and several Asian American organizations issued statements in protest of the Seattle-based production, including the OCA and JACL. This national conversation on yellowface may have its focal point in Seattle, but the issue extends far beyond that city. For, as defenders of Seattle’s yellowface production of this operetta have pointed out, “The Mikado” is one of the most popular and widely performed productions out of the Gilbert & Sullivan repertoire. Today, hundreds of productions of “The Mikado” are performed annually in the United States; many recreate the same yellowface that characterized the operetta’s original 1885 run at the Savoy Theatre in London. But the show’s enduring popularity as contemporary and unchallenged yellowface does not negate its racism. Thankfully, the debate first sparked by Seattle’s yellowface production Mikado have inspired others to speak out against yellowface racism elsewhere in the country. 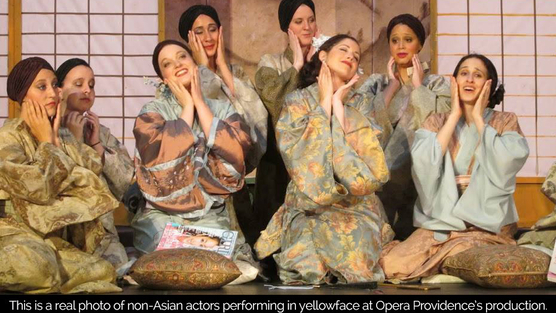 Last month, Opera Providence (located in Providence, Rhode Island) opened a three-night production of “The Mikado” that ran from August 8 – 10, and which also featured actors in yellowface. Several Rhode Island residents courageously organized a street protest and a petition against Opera Providence’s yellowface staging, even though they faced threats and retribution from Opera Providence for exercising their First Amendment rights including an alleged death threat against protesters uttered by an actor during the on-stage production. I had a chance to interview two of the protest organizers, James McShane (@james_mcshane) and Sakiko Mori (@mrsoioi), about what inspired them to take a stand; the full interview appears after the jump. Tell me a little bit about yourselves? James: I have lived in Providence, RI for eleven years and work as an illustrator. Sakiko: I’m from Japan and I’m a musician. 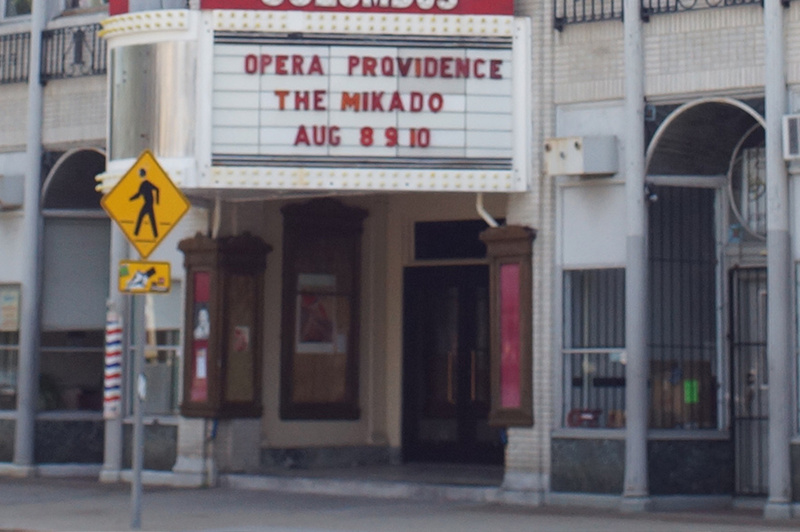 How did you first hear about Opera Providence’s production of “Mikado”? James: This is a theatre in the center of the neighborhood where I live. It is a venue for a lot of vital cultural activity, where bands play and experimental animations are shown. I probably walk past it ten times a day. I found out about the production when I saw The Mikado spelled out on the marquee and the show was about to open. Sakiko: I first found out about it by seeing James McShane’s tweet & Facebook post. 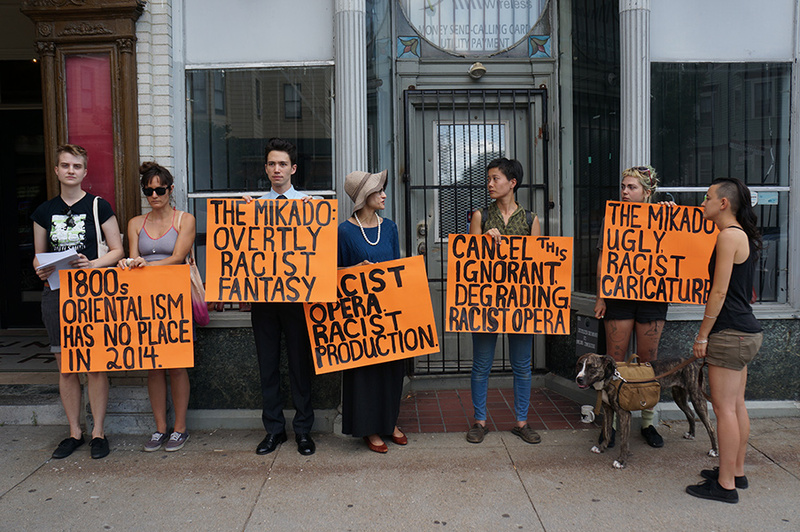 What inspired you to organize a protest against Opera Providence’s “Mikado” production? Were you inspired by the protests going on in Seattle? James: I was following the Seattle protests closely, and have read many of the insightful articles surrounding that production. When I saw that a local company was producing The Mikado in the same thoughtless way, I didn’t want to let it pass without them seeing some visible dissent. Sakiko: I read about the Seattle Mikado protest soon after I found out about Opera Providence’s production. James: Investigating the [Rhode Island] show, I found many still photos posted on the Opera Providence Facebook page showing clownish yellowface portrayals of Asians. I was personally very angry, but still on the fence about protesting, deciding whether I could muster enough community support, and debating whether it would be worth the personal toll of any hostile blowback that I expected to receive from Opera Providence and their audience. Sakiko: Finding out about Opera Providence’s “The Mikado” also made me angry and disappointed that this extremely ignorant production still has a place in 2014, that a lot of people say “it’s fine, it’s an entertainment and supposed to be funny”. I saw that there were so many different levels of racism and ignorance. I had to do something to express that racism is obviously wrong, but also we could be supporting racism without even realizing it. What was the response you received (if any) from Opera Providence? James: There were two rounds of protests, one on Saturday night and again on Sunday afternoon. Saturday night I was joined by two different friends for about twenty minutes each. For long stretches of time I was by myself in front of the theatre holding a protest sign in each hand. Being there alone was good in some ways. I was able to look each audience member in the face as they entered the theatre, make eye contact, say “Good evening,” and let them see a living breathing Asian person before they saw the ugly stereotypes on stage. I am of mixed background, and identify as Asian-American, with a Taiwanese-American mother and Caucasian father. Sakiko: During our quiet protest they called the cops, either laughed or yelled at us, took pictures of one of the protesters and made fun of it on Facebook. James: Many of the audience members, unused to facing criticism, either pretended they couldn’t see me, or shouted angrily back. The response from Opera Providence was loudly defensive. They repeatedly insisted that the show was meant as satire. I don’t believe that they set out to be malicious and cause harm to Asian-Americans, but they showed a total willingness to disregard any harmful impact they are having. One of the lead actors was malicious. He stepped out on to the sidewalk to taunt me, “You’ll be really mad when I come out here in yellowface!” Luckily, at that same time I was discussing the show’s problems with three young women who were passing by and were unfamiliar with the opera. It was a perfect demonstration of the Opera Providence’s callousness and it appeared to be a life changing moment for the people I was talking to. Sakiko: [They also] insulted us on the stage in front of the audience, one of the main actors added the line “killing the protesters” to a song during the performance. James: Sunday afternoon a larger group showed up for the protest. When I first arrived there was a telling moment when a hostile older person yelled, “This is America, we do what we want!” To them I was not part of “we”, or “America”. Our group spoke extensively with a younger couple who came from Boston to see their friend perform. They were opera enthusiasts and we were able to discuss, not only The Mikado, but other shows such as Aida and Madame Butterfly that have similar problems. We saw that same couple from earlier walk out about 30 minutes after start time. They told us that the head of Opera Providence at the start of the show had dismissively made a joke that they would be performing Pirates of Penzance next and they expected protests from the Association of Concerned Pirates. This same couple went to express their distaste for the production to the head of Opera Providence who was standing outside to monitor the protest. He immediately assumed that they were part of our group. The woman of the couple had to make vocal appeals for about ten minutes to get her point across while the head of the company continued to talk over her and make dismissive accusations. James: The Providence Police were called and our group was instructed to stand in front of the address next door and not engage or argue with the company or the audience. The officer that I spoke to respected our right to stand in protest, and advised us not to give them a reason to call in with harassment complaints. Sakiko: Meanwhile, the director of Opera Providence later sent us a threat that he’s trying to have one of the crews of the theatre (where three of their Mikado performances were shown) fired, because he is actively expressing his regret that Opera Providence’s “The Mikado” is offensive and that the theatre couldn’t cancel this show. For the petition which is still going and has over 350 people signed, Opera Providence has been notified but ignoring it (at this time, 8/14). Is there any way that others around the country can help with a future action or event, if you have one planned? Sakiko: Express in any ways that generalization or dehumanization of any race or culture, and the use of ignorant stereotypes as entertainment are among the fundamental seeds of racism, and no matter how the intention of it is, the context matters. Express that people are hurt by it, reminded the brutal history of racism. Express that if you make a mistake, you need to admit it and apologize. If you start expressing it more people will follow. 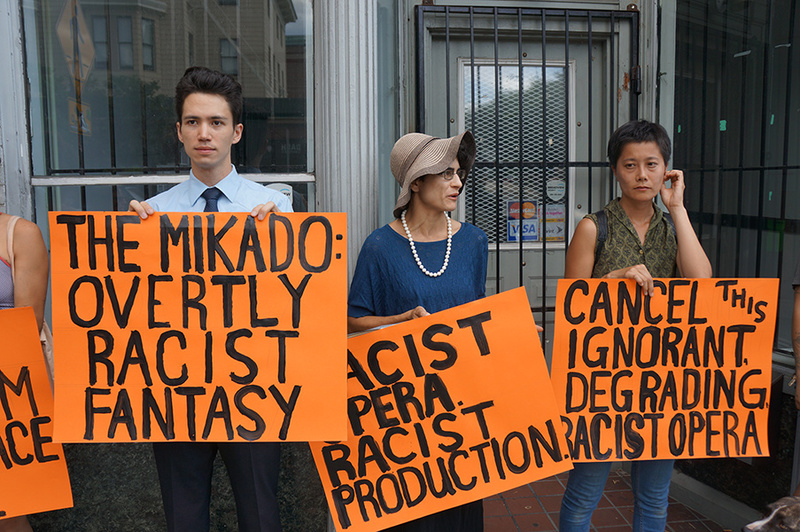 You can also sign the petition for Opera Providence’s “The Mikado”! 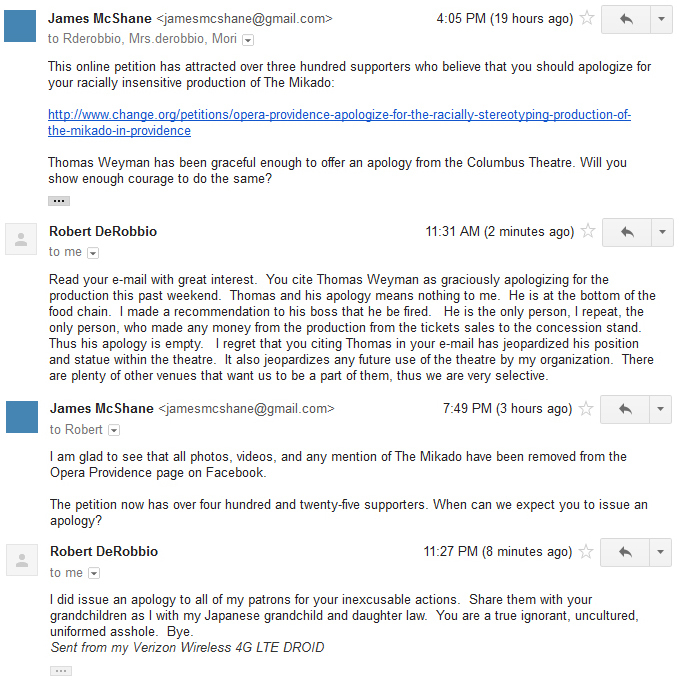 Let me emphasize: in response to a serious concern over the racism of yellowface in “The Mikado”, Opera Providence allegedly mocked and verbally abused peaceful protesters exercising their free speech rights to engage audience members in conversation. According to Sakiko and James, the director threatened to fire crew members who expressed concern over the racism of the production, and one actor issued a death threat against the protesters on stage. That kind of sputtering defensiveness has both characterized the production companies defending their yellowface stagings of “The Mikado”, and is also completely inappropriate. If this is the kind of respect that some theatre companies think is appropriate on the topic of race and racism, no wonder yellowface continues to be performed in relation to “The Mikado”. Today, the Seattle Repertory will be joining forces with the Seattle Office of Arts & Culture to host a diversity townhall, addressing the use (and misuse) of race in the arts. It will be taking place today (Monday, August 18th) at 9:30pm EST / 6:30pm PST at the Seattle Rep, and will be streamed online in conjunction with Twitter discussion at #SeattleAFAR. I will be live-tweeting. It’s imperative that Asian Americans across the country take a vocal stand on yellowface in “Mikado”. James and Sakiko’s story reminds us of how resistant production companies can be when they are engaged in attempts to have meaningful conversations about the impact their staging choices — and specifically racial makeup — might have on communities of colour; but James and Sakiko’s story also teaches us of the power and courage of speaking out in defense of a just cause. Please join me at 9:30pm EST / 6:30pm PST for live-tweet coverage of Seattle Rep’s diversity townhall on yellowface in “The Mikado”. I will be tweeting through #SeattleAFAR.